Our graduation garment bag has easy and convenient carry handles and will accommodate all styles of the graduation gowns we sell online. This premium polyester Ribstop material garment bag with an easy full length front access zipper is a great way to protect your gown and Academic Regalia form getting dirty as well as giving you an easy way to carry your gown around when traveling for graduation commencements. 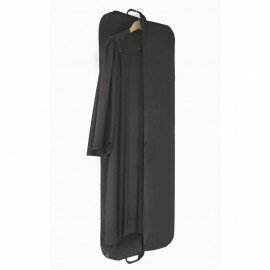 Gradshop.com offers superior craftsmanship and high quality garment bags in two sizes for your convenience: 55” and 66”. The 66” bag is perfect for those extra-long graduation gowns and doctoral robes. Our garment bags will adapt to a variety of hangers with the top enlarged opening and will help keep your graduation gowns wrinkle-free when hanging. It can be purchased individually or purchased in large quantities to receive huge bulk discounts. Why wait? Speak to us right now!